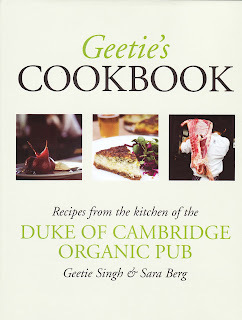 If you haven't heard of Geetie Singh, well, she's pretty much a legend on the UK organic food circuit. She's like the lone ranger of organic restaurant eating - not only is she a female restaurateur (in a very male-dominated trade) but she founded and still runs the UK's only existing Soil Association-certified gastropub: The Duke of Cambridge, based in Islington, north London. You will find her regularly in the pub chatting with staff and suppliers, often accompanied by her baby daughter and chocolate coloured labrador. She grew up on a commune where they grew all their own veg and made all their own bread, and grew her pub business from nothing. She's a cool dude! It's really tough running an organic restaurant - not only is every morsel of food sourced to the very strictest of Soil Association standards, but the chefs cook according to the seasons, changing their menu twice daily. They only use small independent producers with impeccable credentials. And the pub - wow, it's lovely! Really cosy and warm, with wonderful food that is both hearty yet sophisticated. The chefs make all their own bread, ice cream and pickles. 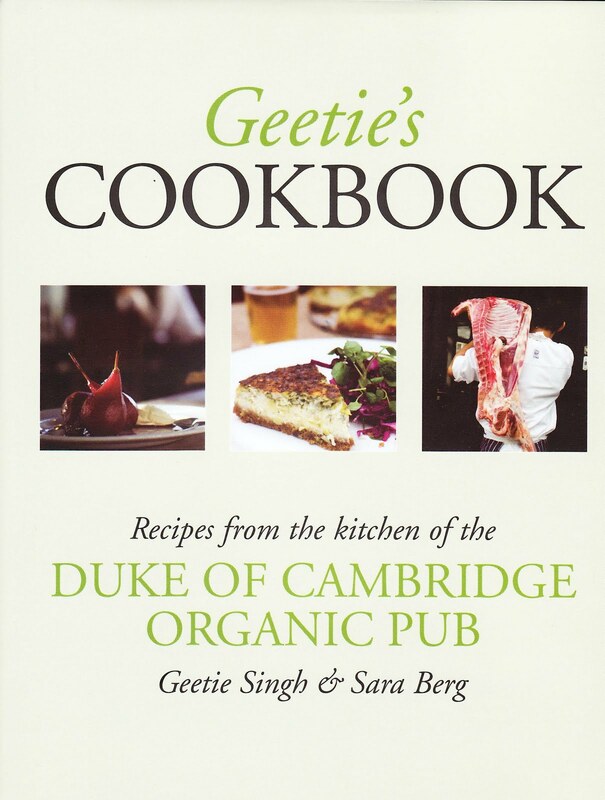 Geetie has just published her first cookbook, co-written with her head chef Sara Berg, and I made the chocolate pots recipe at the weekend. It's rich, chocolate heaven: tastes eye-poppingly decadent yet is easy to make. Put the chocolate in a bowl and melt over a saucepan of simmering water. While this is melting, mix the cream, milk and egg yolks in a large bowl. Sieve the icing sugar into the cream mix. While the chocolate is still hot, add this to the cream mix and whisk. If it does not thicken up, place back over simmering water for a few minutes while whisking. Pour into ramekins, cups or glasses, and put them in the fridge. Serve on their own with biscotti. I served mine with soft almond amaretti where I substituted the orange zest and orange flower water with ground cardamom, which goes really well with chocolate. No 1 Husband used to work next door to The Duke of Cambridge. With sadness I emphasise the 'used to' part. Good new job but....no more working next to Most Excellent place!